Sydney Airport expects international travellers passing through its terminals to double over the next two decades and underpin an expected 50 per cent increase in passenger numbers by 2039. 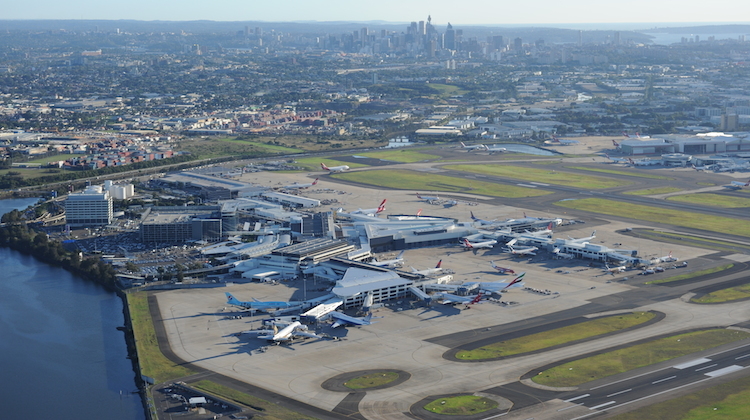 The forecast was included in Sydney Airport’s draft master plan, which outlines the airport’s plans for its operations and development for the period to 2039 and beyond. “Total air passenger numbers are forecast to increase by 51 per cent, from 43.3 million in 2017 to 65.6 million in 2039,” the master plan published on Monday says. Sydney Airport had 43.32 million passengers in calendar 2017. Of those 63 per cent, or 27.35 million, were domestic travellers and 37 per cent, or 15.97 million, were international passengers. However, the gap between domestic and international was expected to narrow over the next two decades. “By 2039, we anticipate that the split between domestic and international passengers travelling through the airport will be 52 per cent and 48 per cent respectively,” the master plan says. Sydney Airport says its passenger forecasts were based on the assumption that the proposed airport at Badgerys Creek in Sydney’s west would be open for business from late 2026. 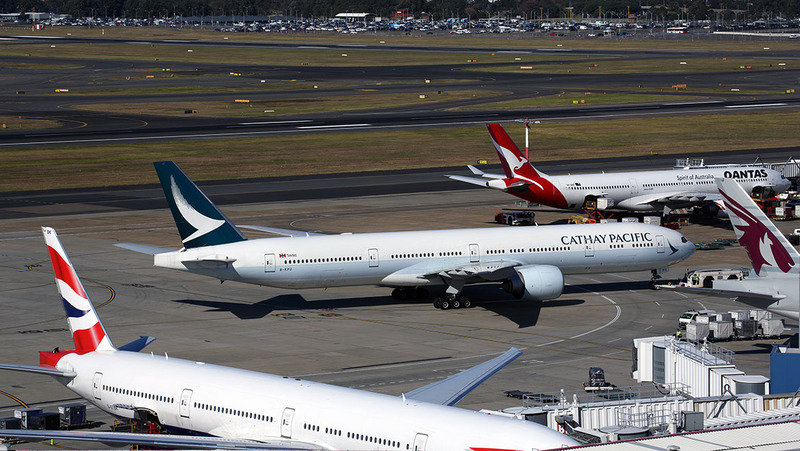 “Sydney Airport is expected to continue to benefit from its proximity to the Sydney CBD and local tourist attractions, and its breadth of network connectivity for passengers travelling internationally, domestically and regionally,” the master plan says. While the total number of passengers is tipped to swell over the next two decades, the expected number of annual aircraft movements would grow by a more modest 17 per cent, from 348,520 in 2017 to 408,260 in 2039. The master plan says this reflects “airline feedback and expectations regarding continued upgauging of aircraft and increased seat density and load factors”. Further, it says the three existing runways could accommodate the expected growth in aviation, with improvements to taxiways, aprons and infrastructure delivering operational efficiencies. 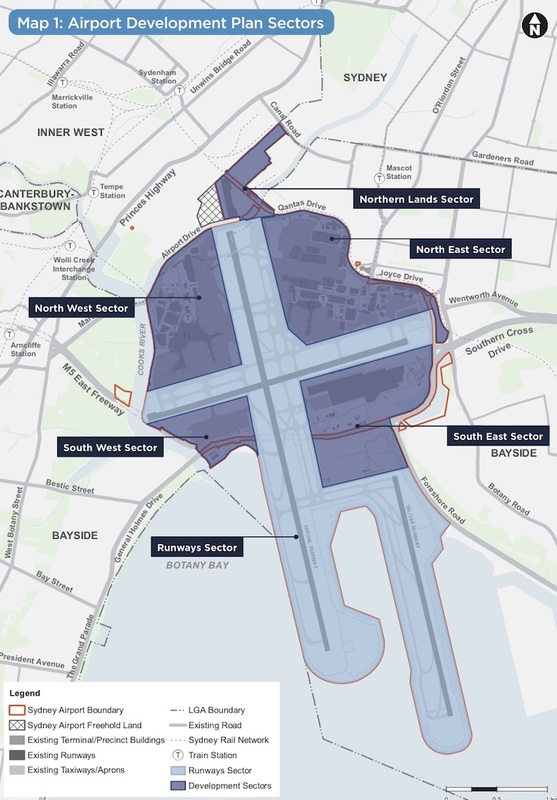 “Master Plan 2039 assumes that there will be no change to the curfew, aircraft movement cap or noise sharing arrangements at Sydney Airport, and no change to the flightpaths or runways within the planning period,” it says. Currently, Sydney Airport’s Terminal 1 on the western side of the airfield handles all international flights, while Terminals 2 and 3 only have domestic flights. The master plan says T1 is envisaged to remain for international flights only, unlike the previous 2033 master plan. “International, domestic and regional operations can be delivered at T1 but it is not foreseen within the planning period of Master Plan 2039,” it says. The 2039 master plan says infrastructure improvements for T1 over the next two decades may include an extension of the existing terminal to provide more contact gates, as well as border processing and baggage reclaim facilities. It also mentions an airside satellite pier in the south-west sector for international flights. Meanwhile, the master plan outlines previously discussed plans to make Terminals 2 and 3 an “integrated operations precinct that provides for international, domestic and regional passenger services”. This includes plans to add extra facilities within the Terminals 2 and 3 precinct, as well as a new satellite pier in the south east sector of the airport. “New infrastructure adjacent to the existing T2 and T3 terminals could deliver significant international and domestic/regional swing contact gate capacity,” the master plan says. The two terminals could also be linked to “facilitate transfer of domestic/regional passengers and new larger aircraft gates”. Other proposed airfield developments included new remote aircraft parking stands, a new air traffic control tower in the south-east sector of the airport and new freight facilities, as well as “a sustainable inter-precinct passenger transfer product that over time would utilise autonomous vehicles”. “A benefit of the terminal development plan is the reduction in inter-precinct transfers,” the master plan says. “The ability to transfer passengers and baggage within the same or adjacent terminal facility is considered to be the most reliable, convenient and efficient method of transfer. Accordingly, a reduction in the minimum connection time to transfer passengers between flights will be possible. “An airside transfer product provides a reliable service as well as avoiding the need for passengers to be processed twice. The transfer product is proposed to be provided to inter-precinct transfers along a dedicated shuttle corridor, which will allow passengers to quickly and comfortably connect between precincts. The master plan says future development decisions would be made in collaboration with airlines, was subject to aviation demand and would involve extensive community consultation. In terms of ground transport, the master plan outlines a proposed new multi-storey pick-up and drop-off facility at the international terminal T1, and upgrades to surrounding roads into and out of the airport. There is also a new transport interchange planned for the Terminal 2/3 precinct currently under construction. Sydney Airport chief executive Geoff Culbert says the master plan was designed to accomodate the forecast 51 per cent increase in passenger numbers. “The plans are flexible and adaptable and will be developed in collaboration with our airline partners and in consultation with the community in which we operate,” Culbert says in the master plan. Under the Commonwealth’s Airports Act, Australia’s federally leased airports are required to prepare a 20-year master plan every five years. A public consultation process will follow the release of the 2039 master plan. The full document can be read here. Sydney Airport’s previous master plan was approved in 2014. Wonder what the master plan would reflect if any politician had the will to remove the movement cap and let Sydney reach its full potential?? While air traffic growth can be alleviated by increasing the movement cap , getting passengers to and fro airport needs a major rethink including removing the tax on passenger movements through the airport stations. Domestic pick up is a joke unless the strategy is to charge all users a movement fee. …..never mind this master plan to fix the airport, how about fixing the congested roads outside the airport or nobody will be going anywhere!. Marsh Street, West Botany Street, Wickham road, Forrest Road, Princess highway in that order!.